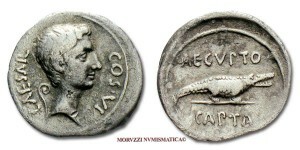 Born Gaius Octavius Thurinus into an old and wealthy equestrian branch of the plebeian gens Octavia, his maternal great-uncle Julius Caesar was assassinated in 44 BC, and Octavius was named in Caesar’s will as his adopted son and heir. Then known simply as Octavianus, he along with Mark Antony and Marcus Lepidus formed the Second Triumvirate to defeat the assassins of Caesar. Following their victory at the Battle of Philippi, the Triumvirate divided the Roman Republic among themselves and ruled as military dictators. The Triumvirate was eventually torn apart by the competing ambitions of its members. Lepidus was driven into exile and stripped of his position, and Antony committed suicide following his defeat at the Battle of Actium by Octavian in 31 BC. After the demise of the Second Triumvirate, Augustus restored the outward façade of the free Republic, with governmental power vested in the Roman Senate, the executive magistrates, and the legislative assemblies. In reality, however, he retained his autocratic power over the Republic as a military dictator. By law, Augustus held a collection of powers granted to him for life by the Senate, including supreme military command, and those of tribune and censor. It took several years for Augustus to develop the framework within which a formally republican state could be led under his sole rule. 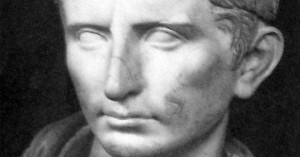 He rejected monarchical titles, and instead called himself Princeps Civitatis (“First Citizen of the State”). The resulting constitutional framework became known as the Principate, the first phase of the Roman Empire. The reign of Augustus initiated an era of relative peace known as the Pax Romana. The Roman world was largely free from large-scale conflict for more than two centuries, despite continuous wars of imperial expansion on the Empire’s frontiers and the year-long civil war known as the “Year of the Four Emperors” over the imperial succession. Augustus dramatically enlarged the Empire, annexing Egypt, Dalmatia, Pannonia, Noricum, and Raetia, expanding possessions in Africa, expanding into Germania, and completing the conquest of Hispania. 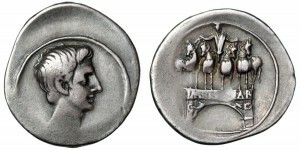 Augustus chose Imperator (“victorious commander“) to be his first name, since he wanted to make an emphatically clear connection between himself and the notion of victory, and consequently became known as Imperator Caesar Divi Filius Augustus By the year 13, Augustus boasted 21 occasions where his troops proclaimed “imperator” as his title after a successful battle. Almost all of the fourth chapter in his publicly released memoirs of achievements known as the Res Gestae was devoted to his military victories and honors. Dalmatia’s name is derived from the name of an Illyrian tribe called the Dalmatae who lived in the area of the eastern Adriatic coast in the 1st millennium BC. It was part of the Illyrian Kingdom between the 4th century BC and the Illyrian Wars (220, 168 BC) when the Roman Republic established its protectorate south of the river Neretva. It was slowly incorporated into Roman possessions until the Roman province of Illyricum was formally established around 32–29 BC. Parthia had always posed a threat to Rome in the east, but the real battlefront was along the Rhine and Danube rivers. Before the final fight with Antony, Octavian’s campaigns against the tribes in Dalmatia were the first step in expanding Roman dominions to the Danube. Victory in battle was not always a permanent success, as newly conquered territories were constantly retaken by Rome’s enemies in Germania. On August 13, 29 BC Octavian held the first of three consecutive triumphs in Rome to celebrate the victory over the Dalmatian tribes.